Hi there! 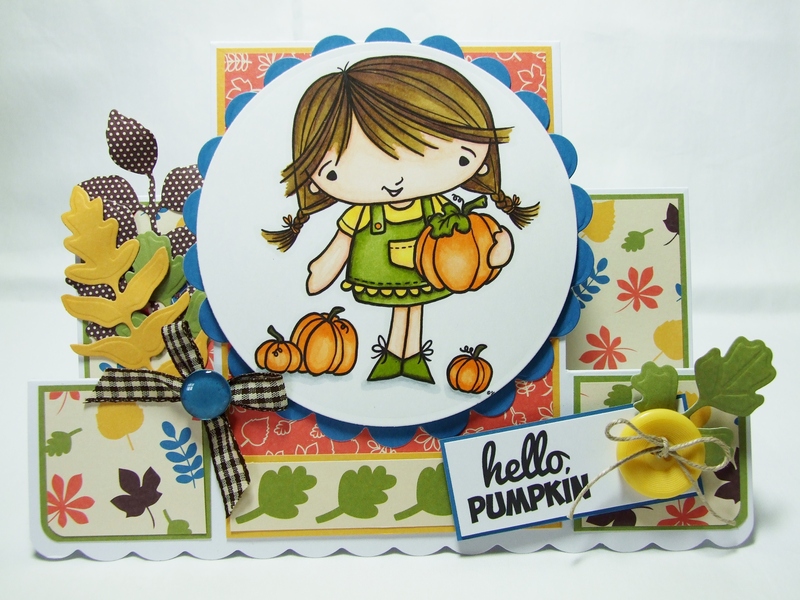 Just popping in today to share this card that I have made using September’s Digital Stamp of the Month Challenge over at fromtheheartstamps.com called Pumpkin Patch Girl. If you want to play along click on the link above for more details. My cute little girl was coloured with Spectrum Noirs and these pretty, autumnal papers are by Craft Asylum called ‘Into the Woods’. I have also used Spellbinders Foliage, circle and scalloped circle dies. The blue centre of bow was made with an Epiphany tool. < Previous “…..had a very shiny nose!”…..
Karen, this is stunning! Your coloring is awesome and what an amazing creation! Beautiful!! This is precious!! You did a great job with the image and the details of this card are incredible!! Love it! Very sweet step card, Karen. Your coloring is fabulous and i like the matching DP and the little extras like the leaves, button and so on. 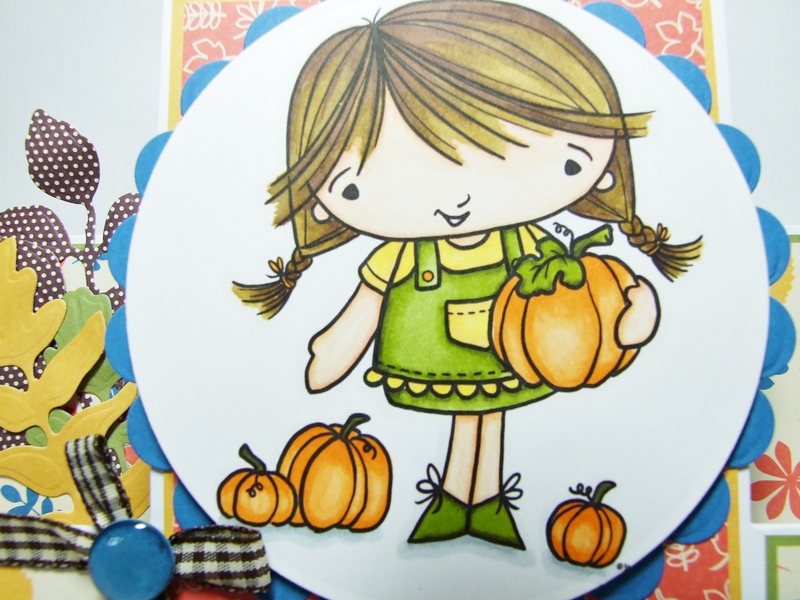 Thanks for joining our FREE Stamp of the Month September Challenge @ From the Heart Stamps !!! AWESOME!! what a lovely stepper card, the colours and papers are perfect. Thanks for joining in the fun with our SOTM challenge at FTHS. Adorable card, Karen! Love the sweet image and fun fold! 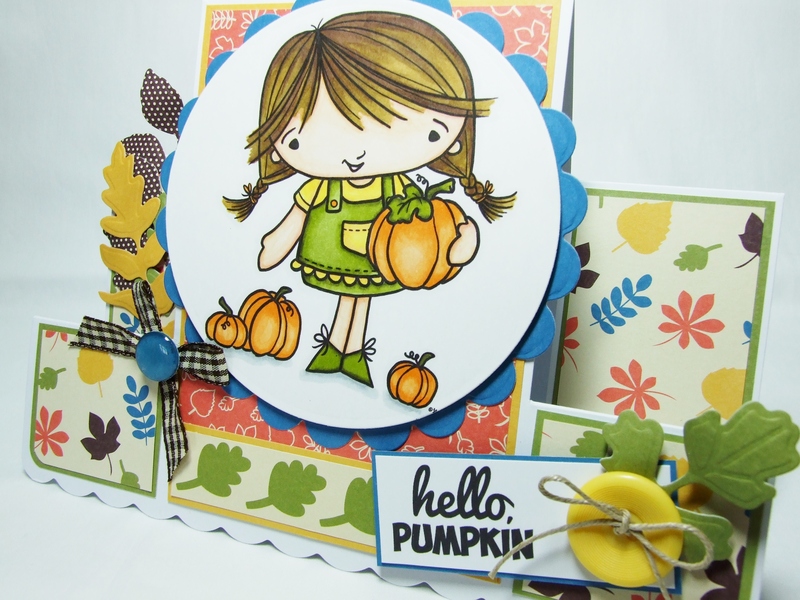 Wonderful fall card and even better side step card. She just makes me smile. Adorable – gorgeous fall colors and textures. Thank you for joining The Cat’s Pajamas TCP Tuesday challenge.